We increasingly live in a sharing, if not necessarily caring, world. We put our lives on public display via Facebook and Twitter, and invite ‘friends’ (in the case of the former) or even total strangers (the latter) to share them. For journalists, these are part of our broadcast tools: a way of getting our content out there and encouraging a public dialogue about it. I’ll never forget the actor I met at a stage door once, who knew a lot more about me than I did about him: after he recited where I’d been and what I’d seen in the previous week, he said to me: “It’s like we’re in a relationship.” Maybe for him – but not for me, as I wasn’t paying reciprocal attention to the details of his life. Boundaries are being blurred between public and private. No wonder that people are increasingly unsure of where to draw lines, and anything that happens in public feels publicly owned – and duly shareable. I’ve seen audiences do some dumb stuff. But, tonight, there is a guy in the fifth row who FaceTimed our opening number, with the screen facing the stage, so we could see the woman on her couch eating Cheetos on the other end. This takes the stupid cake. You can understand the confusion that could arise in an audience member who, aware that theatre performances are now broadcast live to cinemas via NT Live and the like, thinks they are entitled to act as a private broadcast channel to their friends at home. Theatre invites you to be uniquely ‘in the moment’ but, for many, it’s now important also to capture it so that you own it forever. Camera phones are ubiquitous at live events. At music gigs, producers have seemingly given up the battle to stop people using them. 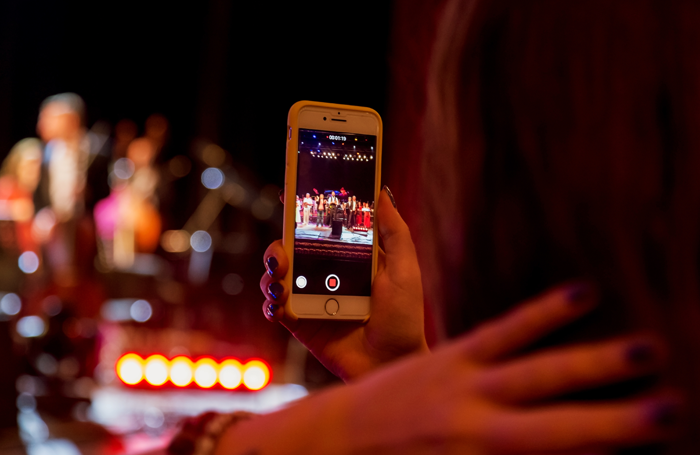 For Cirque du Soleil’s residency at the Royal Albert Hall, the company asked that we refrained only from using flash photography, but audiences were openly invited to take photographs and short videos – and post them online. The audience became part of the show’s viral marketing. The glow of a thousand smartphone screens duly lit up the auditorium. Never mind the gasp-inducing acts of human daring and skill we witnessed first-hand; many missed that chance so they could experience them second-hand via a tiny video or image from their phone. At the rather larger Barbican, I once confronted a woman who had been taking flash photography during a Philip Glass opera; it turned out to be Bianca Jagger, and the show’s Robert Wilson duly tweeted support for her and thanked her for attending when the furore became public. Both are stories of entitlement: familial or celebrity, they felt that their claims on recording the event superseded those of others trying to enjoy the respective productions. It seems this feeling of entitlement is beginning to spread. And as these rules are being rewritten by the venues themselves, with some creating ‘tweet zones’ from which people can send messages as they respond to the performance, perhaps trying to police this behaviour is a losing battle. When Theatreland character West End Producer suggested jokily in his latest book that “theatre prefects” be introduced to monitor behaviour, there was an outcry. In Exeunt, Alice Saville complained that it, and the Theatre Charter devised as a guide to theatregoing etiquette, “are infuriating for the pedantic, schoolteacher-ish spirit they’re conceived in”. She also complained about the schoolteachers and middle-class parents who wouldn’t engage with the shows although their charges did. Clearly this is class war by another name. Actually, it’s all about respect – for your fellow audience members and the performers – in a shared experience. And if we need a few rules to make what is and isn’t acceptable a bit clearer, so be it.